Enter your email address below to receive a notification when PupJoy starts accepting new sign-ups! Enter your email address below to receive a notification when PupJoy is accepting new sign-ups again. 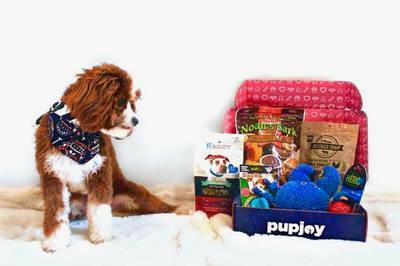 The #1 rated subscription, custom-tailored for the needs of you and your pup. Enjoy the convenience of personalized deliveries by providing profile information and letting us do the work for you. We ship within 1 business days of your order. Free shipping to the US, just $5 to Canada. Winner of the Purina Pet Care Innovation Award. Share the excitement unboxing joy with your dog plus get exactly what you need, when you need it. You save money because we cut out the middlemen and buy directly from the manufacturer. Feel good by helping shelters animals too. In partnership with the Bissell Pet Foundation, our Helping Paws program aids these animals in need with every purchase. I've tried other subscription dog boxes for my Pitt Bull rescues and they both love everything, despite the fact that they are very picky. I got two chew toys, healthy treats, and a bully stick that I cut in half so they'd each have one. The toys last despite the fact that they are serious chewers. I've cancelled other subscriptions finding I could get better products individually for a better price, but not this one with Pup Joy. This subscription is a keeper! At one time I was crazy about these boxes. I however stopped due to a move etc. I went back to them recently for several month. I was shocked to recieve the same toys and treats, the local shop were not apart of the boxes I recieved. Even with the discount the price is high to get the same toys your dog got last year. I left with lots of points which I really did not care I am losing money off. The toys are subpar for the news ones not counting I only got one box for 2 dogs and even though I live close to their shipping office they take forever to ship.